In the spirit of US college basketball’s March Madness, Lucky18Casino.com is hosting head-to-head multi-level blackjack tournaments every Monday night in March beginning tonight at 10:00 p.m. EST. Every Monday’s “Final Four” will receive $1000 in tournament prize money. $2500 in cash prizes will be awarded at the April 15th Championship for a total of $7500 in cash prizes. Lucky18 is quickly becoming known as a great blackjack tournament host following its two BKJK Bowl tournaments that each awarded more than $50,000 in cash prizes including $21K to the first place player in each tournament. The final four players in each Monday night tournament this month will win free entry to the final “Mano a Mano” Championship on Wednesday, April 15th. Weekly winners will receive $500 with $250 going to the second place player, $150 to the third and $100 to the fourth place player. Twenty-eight players will win free seats at the April 15th “Big Dance” Championship. (Buy-in that night is $55.) The first place player will win $1500. The second place prize will be $750 with $500 and $250 for third and fourth place respectively. Registration is on a first come, first served basis and participation is limited to only 64 players. Players can register in the MultiTournament Lobby at Lucky18Casino.com anytime up until the event. The registration fee is $22. 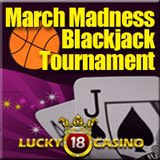 Tournament details are available by clicking “Blackjack Tournaments” on the Lucky18Casino.com homepage. Although Blackjack is one of its most popular casino games, Lucky18Casino.com also offers 16 slot machines as well as craps and roulette. Their massive $1800 Welcome Bonus offer is the most generous deposit bonus anywhere. Powered by Realtime Gaming, Lucky18Casino.com welcomes players from around the world, including the U.S.